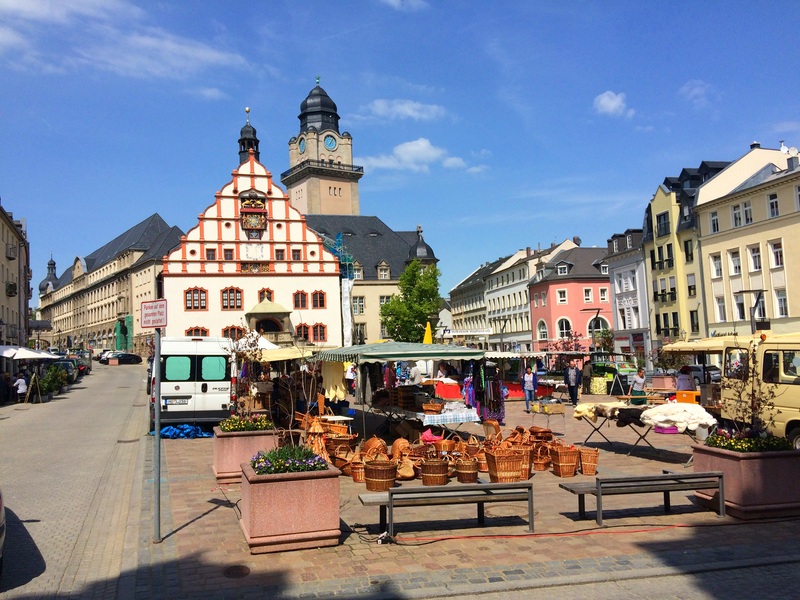 A few weeks ago after speaking at a software developer conference in Berlin Germany, I had the opportunity to take several personal days while there and I got to see some of the countryside! It was pretty great! 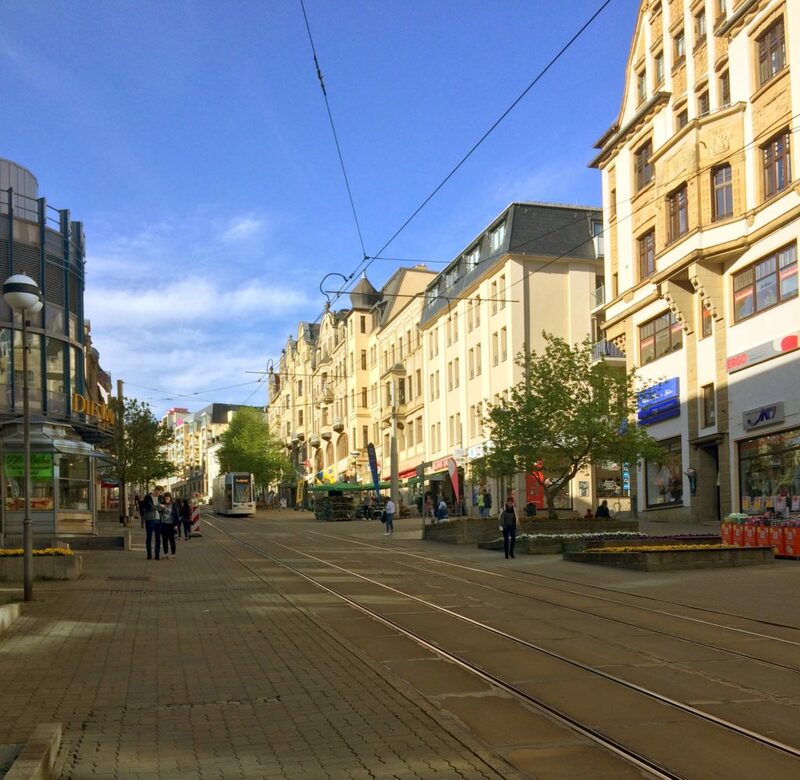 After visiting the tiny little village of Zaulsdorf Germany near the Czech border, I traveled about 30 minutes northwest to the town of Plauen Germany. This is where my grandfather, Kurt William Leucht, lived from about the age of 4 until he left for America at age 18. 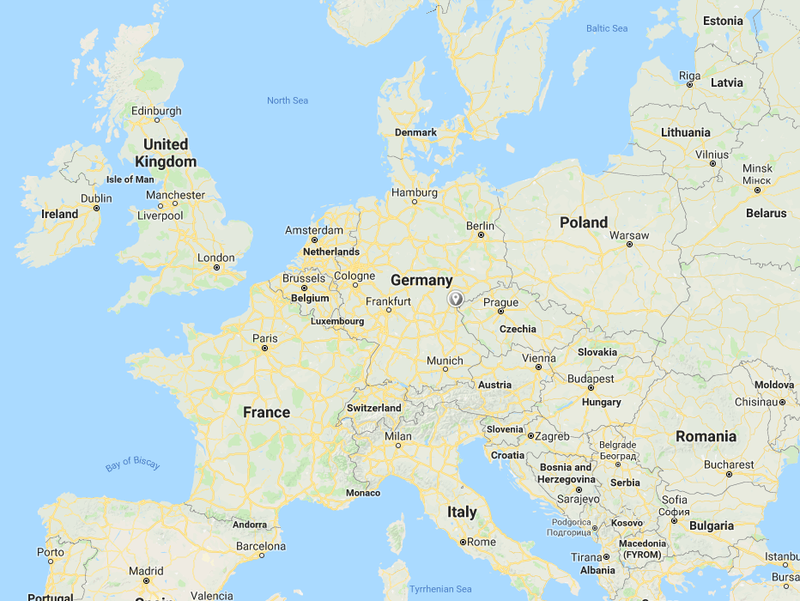 Coincidentally, driving from Zaulsdorf to Plauen is very much like driving from Allentown to Peoria, which is my old stomping grounds growing up. 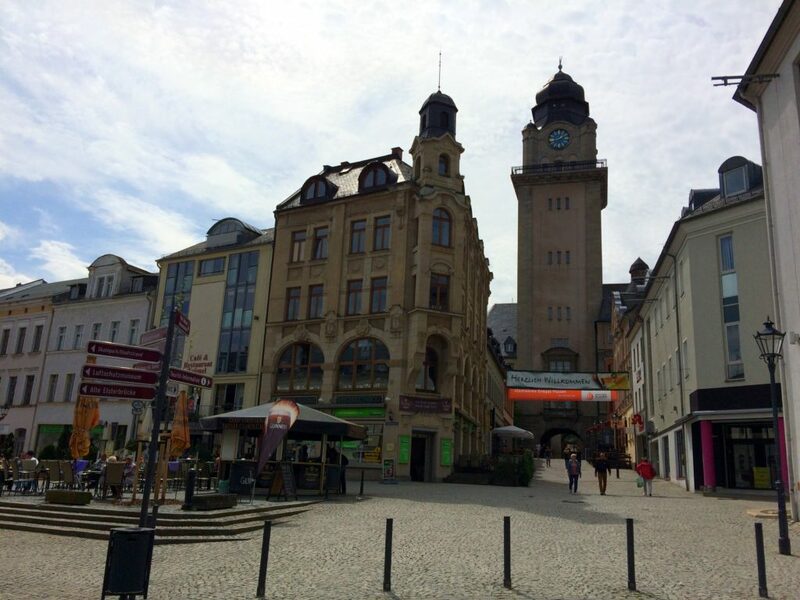 Plauen actually reminds me of Peoria in several ways. But it’s a smaller, less industrialized version of Peoria. Plauen has about 80% of the landmass of Peoria, but only has about 50% of the population of Peoria. So it’s smaller and the population is way more spread out than Peoria. In the early 1900’s Plauen actually peaked in its population. In 1912, when my grandfather was living there at age 16, the population grew to 128,000 people, due to the peak of textile and lace manufacturing there. That population of 128,000 in Plauen in 1912 was more than Peoria’s population is today! Amazing! Plauen feels very safe and friendly. 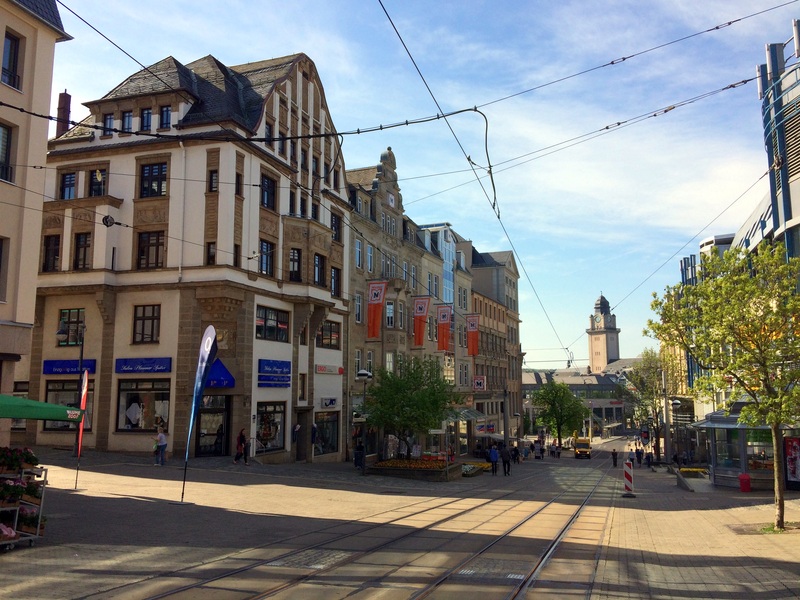 The downtown area of Plauen has modern shops and malls. There are many rolling hills in the area and the downtown strip, where cars are not allowed, is on quite a slope. It gives this strip a unique character. Here is the reverse angle, looking downhill. I felt quite at home in this downtown strip. I walked around for a while checking out all the stores and shops. I imagined my grandfather walking around this same strip about a hundred years ago. Several of the buildings appeared to be over a hundred years old, so they were in place when my grandfather lived here. 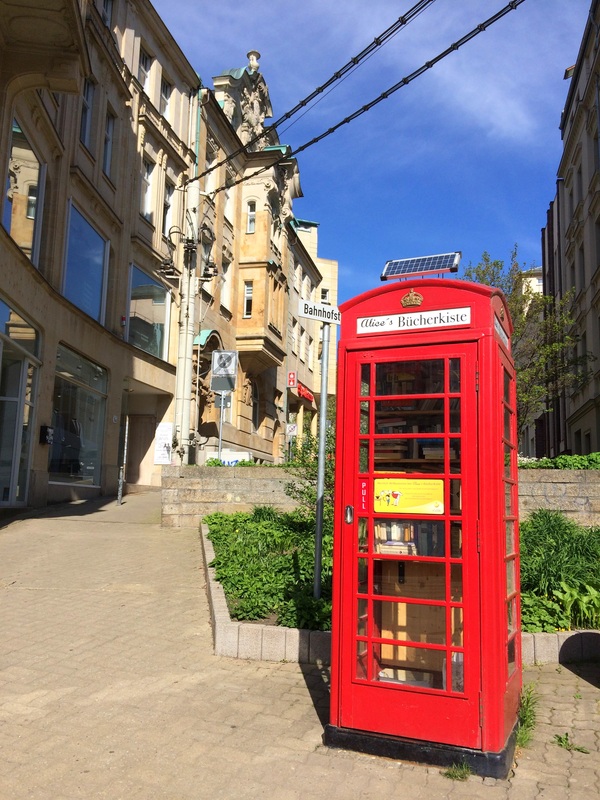 This cute little British phone booth stood out like a sore thumb. It’s called Alice’s Book Box and it’s a free book exchange system. The idea is that if you take a book, you replace it with a new book. Very fun. This photo is just a close up of some cool architecture detail that caught my eye downtown. I tried to find a date plaque on this building but I came up empty. The address is Rädelstraße 2, 08523 Plauen, Germany. 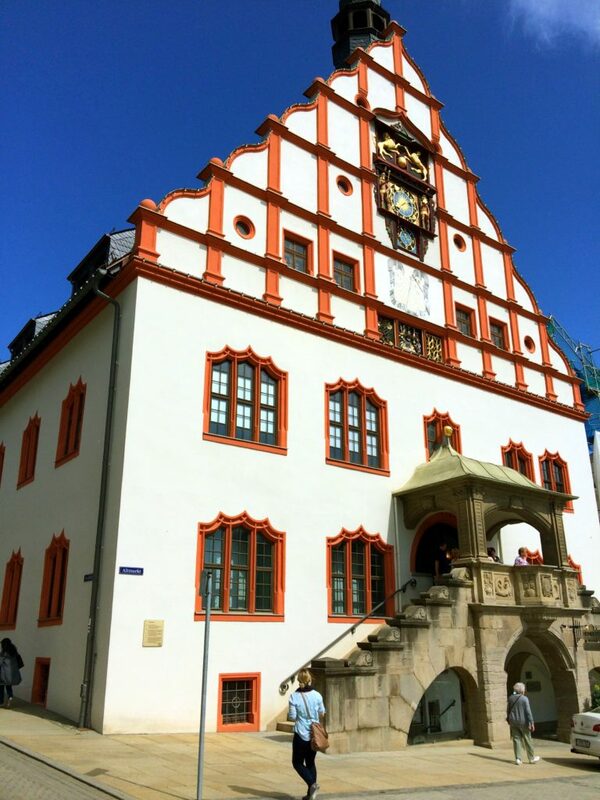 This unique old building is the Altes Rathaus or City Hall. The building has been restored several times over the years, but it’s been around since the late 1300’s. It overlooks a town square or market. Here is one of the markets or squares in the middle of downtown. They contain lots of small businesses and shops and outdoor eateries and cafes. A very nice area to hang out. This statue is pretty famous to the area. It’s called Vater und Sohn or Father and Son. 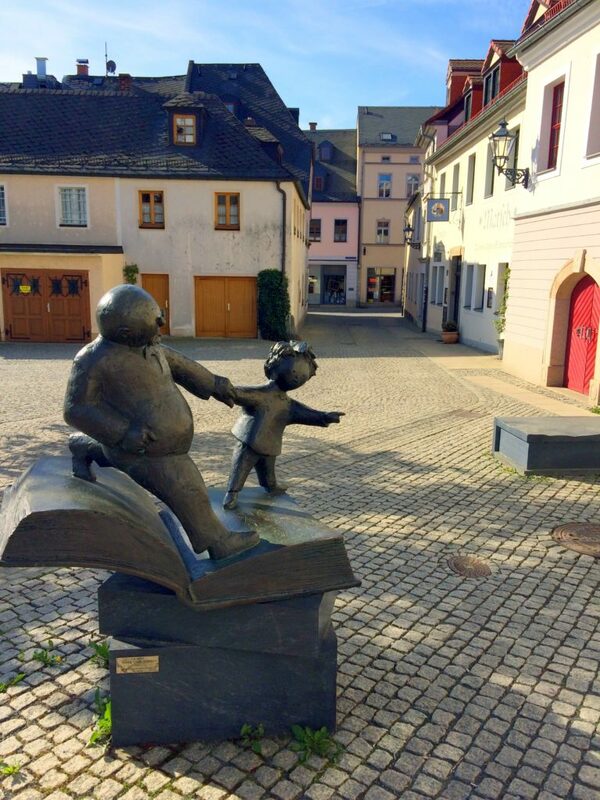 This statue memorializes the local famous comic strip creator Kurt Erich Ohser, who created the popular Vater und Sohn comic strip in the 1930s under the pseudonym e. o. plauen. Here is another market or square that actually had local vendors set up and selling goods when I walked through it. You can see the old city hall at the far corner of this market. 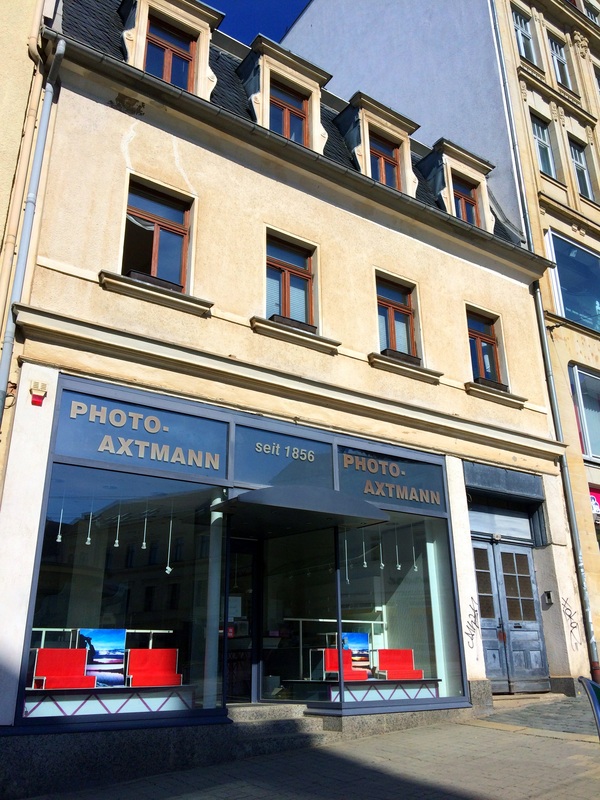 This photo/camera store in downtown Plauen caught my eye because it claims to have been in business since 1856. It also caught my eye because my grandfather was into photography and especially videography in his later years. Did this photo shop in downtown Plauen get him started in that hobby, I wonder? Sadly, this family owned photo business closed just a few months ago. But apparently they ran from 1856 till 2017, which is quite an impressive run. Especially for a small family run business. The local theatre building in Plauen is pretty impressive. It hosts musical theater, drama, ballet and symphonies. 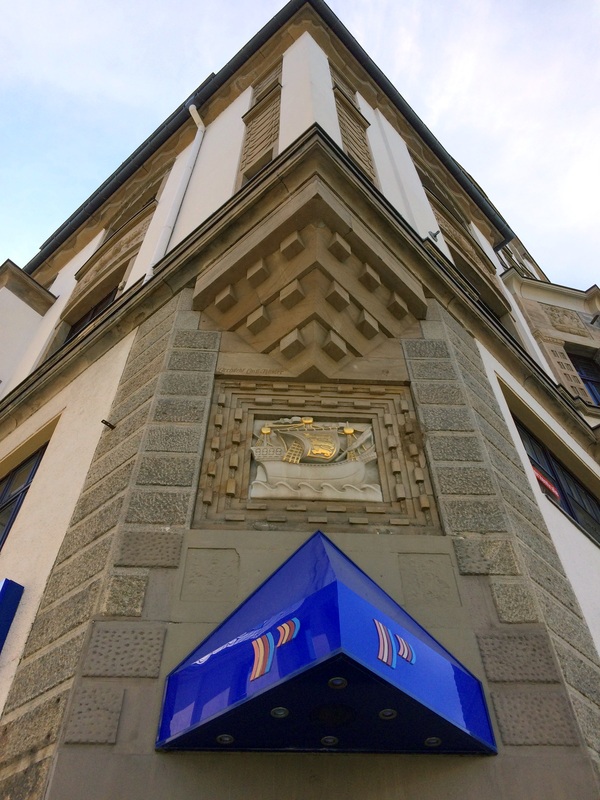 It opened in 1898, right before my grandfather and his family moved to Plauen. I wonder what shows or events my grandfather saw in this theatre while growing up here in Plauen. My parents and my sister and I are all very much into musical theatre and I wonder if any of that interest started right here in this building way back in the early 1900s. My grandfather was very artistic and also quite musical. In his journal, he mentioned that he had become a good tenor singing in his church in Peoria. At age 20 he took a job painting scenery at a theatre in Peoria. His scenery painting gig also allowed him to act on stage occasionally for the troupe. And he acted quite a bit for the Peoria Cinema Club that he became very active in later in life. 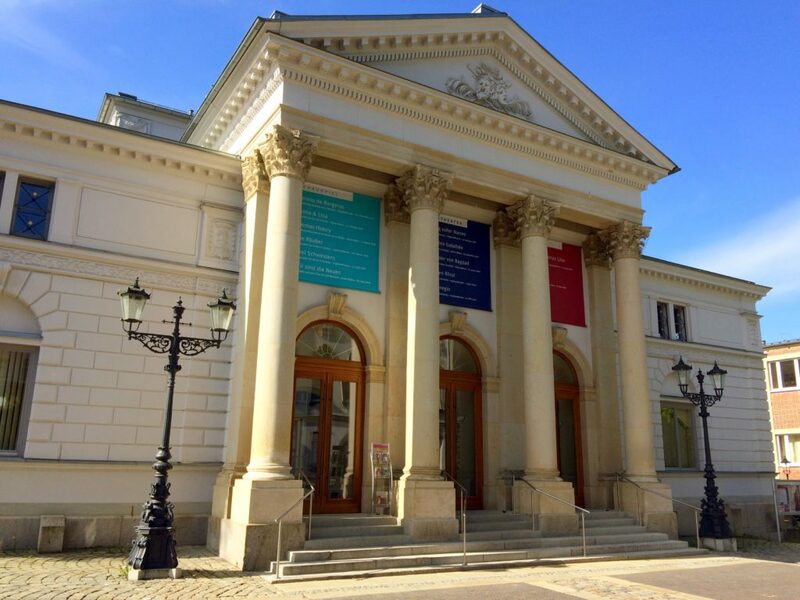 This Plauen theatre could have sparked some of that creativity and theatre interest in him. Although I’ll never know details like these until I talk to my grandfather in heaven, it’s always fun to imagine and to speculate. But wait, there’s more Plauen to explore! You haven’t seen all of Plauen! My next post will focus on some pretty cool old stuff that I came across in my travels! So stay tuned!